This clock was purchased by a wife who wants to keep track of the time where her soldier husband is. What a great idea for knowing what time it is where your special someone is. Always. 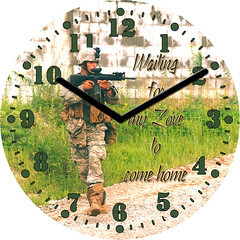 CustomClockFace.com to get yours.